Mr. Chen's - I can't believe I just discovered this place! For years now, people have been telling me that I need to try Mr. Chen's Organic chinese delivery and for some reason I ignored them...until Thursday night. Oh my effen God! Best Chinese Amy and I have ever had!! Everything was fresh. Not to sound like a commercial, but you never would've guessed it was delivery. Quoted from the top of the menu, "At Mr. Chens Restaurant, we use organic fresh vegetables along with a health-conscious cooking style to prepare delicious Chinese cuisine." 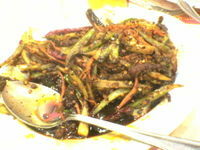 I ordered the Chicken in Black Bean Sauce. It was just slightly spicy and the chicken wasn't overcooked --TONS of flavor (not MSG flavor). My only complaint was that there were not many black beans in the sauce, but it is only a tiny one. Amy got Kung Pao Chicken and loved it as well. Like mine, it was slightly spicy which just kicked the flavor up a bit. I always like that. We also ordered some spicy wontons which weren't all that spicy, but tasted a lot better than they looked. Definitely try the Curry Fried Rice. It was very different from any other fried rice than we had ever had. It is basically your typical fried rice with chicken, pork, shrimp (or vegetarian) and some curry and tumeric spices. The menu gives you the option of small or large portions. If you want a ton of leftovers, order the large. We did and ate them the next day for lunch.